Dr. Alma S. Adams was elected to her first term representing the 12th Congressional District of North Carolina on November 12, 2014. After winning a special election, Congresswoman Adams was sworn in immediately as the 100th woman elected to Congress, the most in U.S. history. Representative Adams sits on the Committee on Education and the Workforce, the Agriculture Committee, the Small Business Committee, and the Joint Economic Committee. She is the Ranking member of the Small Business Subcommittee on Oversight. The Congresswoman is the founder of the first ever Congressional Bipartisan HBCU Caucus and she is part of the Women’s Caucus, Congressional Progressive Caucus and the Art Caucus. Congresswoman Adams also holds a leadership role in the Democratic Caucus as Vice President for the 114th Congress’ freshmen class and she serves as a Regional Whip for the Democratic Caucus. Throughout her career, Representative Adams has promoted quality education for all students, spearheading legislation to boost funds for Historically Black Colleges and Universities and provide nutritious breakfasts in schools, while supporting increased pay for teachers. For 40 years, Dr. Adams taught Art History at Bennett College. While at Bennett, she led the effort to increase student civic participation. Dr. Adams coined the phrase “Bennett Belles are Voting Bells” and organized a yearly march to the polls. As a former educator, Rep. Adams has dedicated her career to improving the lives of young people and her community. In 1994, Representative Adams was appointed by her peers to serve in the North Carolina House District 26 seat. She went on to serve ten terms in the state House. During her tenure, she rose to become the chair of the North Carolina Legislative Black Caucus and was instrumental in passing legislation that improved the climate for quality affordable health care in the state. A working mother of two, Alma pioneered the Displaced Homemakers Bill and successfully spearheaded the state’s first minimum wage increase in nine years. Before serving as a member of the North Carolina General Assembly, Congresswoman Adams became the first African American woman ever elected to the Greensboro County School Board. It was at that time that she made a lifetime commitment to effecting social change in her community and beyond. 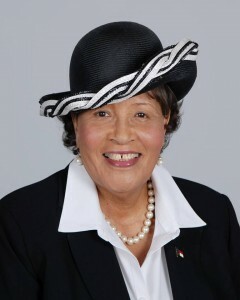 Congresswoman Adams has one daughter, Linda Jeanelle Lindsay and one son Billy E. Adams II. Adams graduated from North Carolina A&T State University in 1968 and received her master’s degree in Art Education in 1972. She earned her Ph.D. in Art Education and Multicultural Education from The Ohio State University in Columbus, Ohio in 1981.